The shallot (Allium cepa var. aggregatum, or the A. cepa Aggregatum Group) is a variety of the species Allium cepa. The genus Allium includes onions, garlic, chives, as well as shallots. Shallots are native to Central or Southeast Asia, traveling from there to India and the eastern Mediterranean. 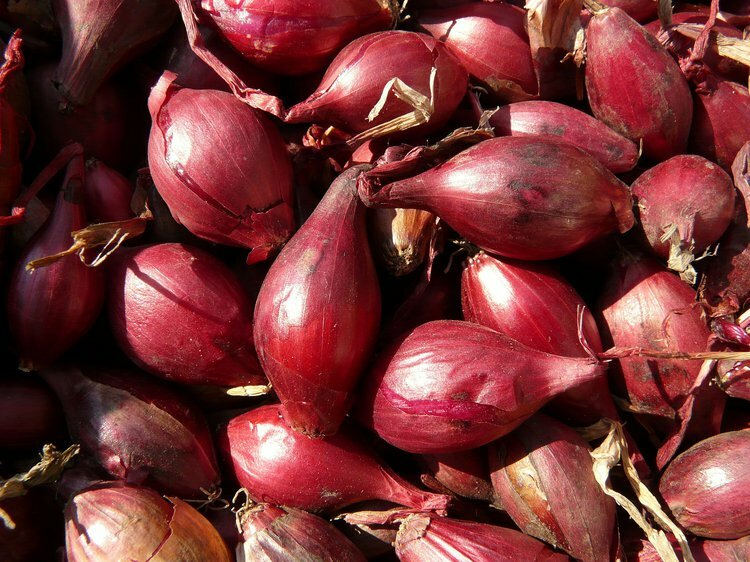 Here are 7 health benefits of shallots. 1. Shallots can help reduce cholesterol. Allicin is a compound found in shallots when being sliced. The compound inhibits a reductase enzyme that is produced in the liver to make cholesterol. A lowered cholesterol level can help prevent atherosclerosis, coronary heart disease, heart attacks, and strokes. 2. Shallots can help manage your blood pressure. An increased potassium intake and decreased sodium intake has been linked to a lowered blood pressure. When the method is used in conjunction with the action of allicin, which releases nitric oxide, the blood pressure is significantly reduced. One hundred grams of shallots contains 334 mg of potassium and only 12 mg of sodium. 3. Shallots can help improve heart health. Also, shallots possess an anticoagulant called allicin. This can cause peripheral vascular diseases, coronary artery disease, and stroke. 4. Shallots can help increase blood circulation. Shallots contain more iron and copper than onions. These minerals help increase the blood’s circulation by stimulating red blood cell production. More red blood cells are correlated with more oxygen, encouraging cell regrowth, healing, and metabolism. 5. Shallots can help individuals with type 2 diabetes manage sugar. The fiber content in shallots can ensure a slow release of sugar into the blood. Also, allium and allyl disulfide possess antidiabetic properties, which can help keep their blood sugar levels under control. 6. Shallots can contribute to aid your brain cells performing better. Vitamins and minerals like pyridoxine can help stimulate the release the neurotransmitter GABA. This helps individuals maintain low-stress levels and relax the mind. Also, shallots are a good source of folate. Folate has been known to reduce the occurrence of Alzheimer’s disease and cognitive decline. 7. Shallots can help your eye sharp and healthy. Shallots are rich in vitamin A with 24 percent of the daily recommended need per serving. Vitamin A is known for improving your eyesight and preventing night blindness from developing as we age. EBRAHIMI, R., Zamani, Z. A., Kashi, A. A. K., & JABARI, A. (2008). Comparison of fatty acids, mineral elements of 17 Iranian shallot landraces (Allium hirtifolium Boiss.). Gebhardt, R., Beck, H., & Wagner, K. G. (1994). Inhibition of cholesterol biosynthesis by allicin and ajoene in rat hepatocytes and HepG2 cells. Biochimica et Biophysica Acta (BBA)-Lipids and Lipid Metabolism, 1213(1), 57-62. Verlangieri, A. J., Kapeghian, J. C., El-Dean, S., & Bush, M. (1985). Fruit and vegetable consumption and cardiovascular mortality. Medical hypotheses, 16(1), 7-15. Azadi, H. G., Ghaffari, S. M., Riazi, G. H., Ahmadian, S., & Vahedi, F. (2008). Antiproliferative activity of chloroformic extract of Persian Shallot, Allium hirtifolium, on tumor cell lines. Cytotechnology, 56(3), 179-185.